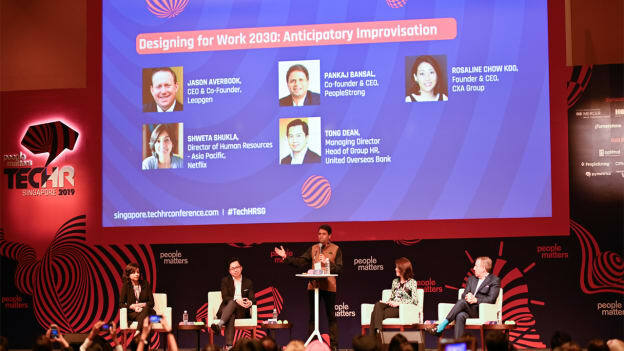 At People Matters TechHR Singapore 2019, a panel of HR and business leaders discuss a few HR practices that need to change as businesses tread towards work 2030. Digitization and smart automation will rule the workplace trends in 2030. Combinations of machine learning, robotics, artificial intelligence, and other technologies are already transforming the workplace at an unprecedented pace. While the role of the HR will shift from transactional to a more strategic role, they also have the responsibility to help organizations and the talent navigate through the changing workplace dynamics. To discuss these changing workspaces and structures, a panel of HR and business leaders including Jason Averbook, CEO & Co-Founder, Leapgen, Rosaline Chow Koo, Founder & CEO, CXA Group, Shweta Shukla, Director of Human Resources - Asia Pacific, Netflix and Tong Dean, Managing Director, Head of Group HR, United Overseas Bank came together in a session moderated by Pankaj Bansal, Co-founder & CEO, PeopleStrong and shared a few HR practices that need to change. For ages, graphs, curves, and forced distributions have been HR professional’s best friends when it comes to identifying, describing and solving people challenges. But as the demographics and the dynamics of the talent, we have now and will have in the future, transforms and becomes more complicated, these tools have to be replaced or transformed. The HR teams have to shift their focus now on building more sustainable policies and culture which would require them to visualize and look at people’s problems from beyond closed samples, that tell only part of the story. The one size fits all approach is already fading away. Organizations today have a diverse workforce with diverse needs. Besides that, it's time that HR professionals understand that not every individual in the organization will be at the same stage in their life. What might work for one, might be completely worthless for another. This holds true in terms of benefits, perks, L&D programs, and many other aspects. “Benefits need to be designed on the basis of what we need as an individual. For instance, what the family situation is,” suggested Shukla. The one way in which HR and business leaders can bring this to practice is through technology. The power of data, that can be pulled out using the current and upcoming new solutions in the market can be leveraged to construe people challenges and make decisions. The other way in which tech can be useful is through an ecosystem that can connect all of the vendors related to employees benefits which they can tailor for themselves as per their requirements. “This system would further help the company in gathering and consolidating all the data to understand the employees better,” added Chow Koo. A system or process can only be scaled or be transformed if the base is strong. For HR professionals to take the next leap, it is important that their fundamentals are clear and the foundation they design the workplace for the future on is strong. These strong fundamentals also help in deciding the right solution for the people and work challenge most relevant for a particular organization. A good combination of basics and tech can thus help the HR teams, business leaders and managers create an awesome employee experience that fits the workplace needs, whether current or future. This is where technology can be useful and allow HR business partners to truly focus on solving the problems for the talent proactively. By automating all or most of the transactional and operational functions HR professionals can play the role of a strategic leader who owns and leads the people agenda for business from the front.